Bring all your business printing jobs to Foremost Printing for speedy, friendly service and high-quality products. Save money, avoid the hassles, save time, and look good in front of your customers – or your boss. Let Foremost Printing handle all your printing needs. 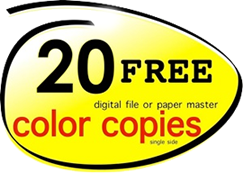 Fast and reliable printing services trusted by thousands of clients. Family owned and serving the Renton, Kent, Auburn, Washington area since 1989. Contact us today for a quick and accurate quote on your next print job! You’ll be glad you found Foremost Printing!